I am a kitchen gadget geek. I love looking through the aisles at stores like Bed, Bath and Beyond or at the cooking section of the Ikea website. Instead of having a closet full of shoes, I’d love to have drawers filled with whisks, bench scrapers, and rubber spatulas. So for the next few Wednesdays I am going to share my favorite gadgets and small appliances and probably talk about the ones I’d like to have but they haven’t found their way into my kitchen. 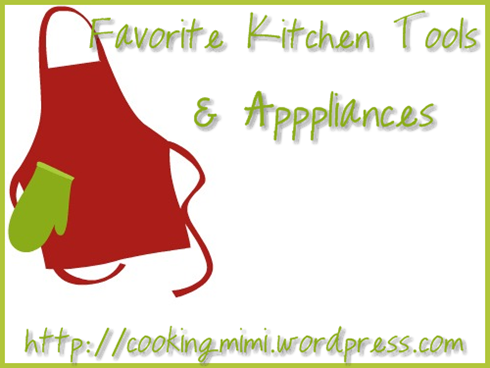 I love kitchen gadgets – some I bought and never used (shame on me)!! Can’t wait to see what you love and/or want!!!! I’ve had a few items over the years that I never used or only used once or twice. The items I will be sharing are ones that if if they broke or were lost would be replaces as soon as possible. Love Bed Bath and Beyond , especially the kitchen tool section. I can browse that area for a good hour!